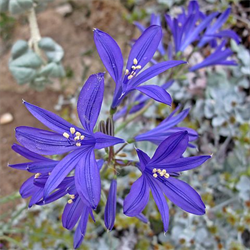 Notes: These Ixiolirion tataricum bulbs produce four to five lily-shaped flowers of a striking violet blue color on each stem. The foliage of these Lavender Mountain Lilies are sometimes evergreen depending on the severity of the winter. Use this versatile plant for an interesting addition to the border, for naturalizing, or the cutting garden. Does well in sandy soil in the sun.